HEARTS is guided by six core guiding principles for creating trauma-informed schools. 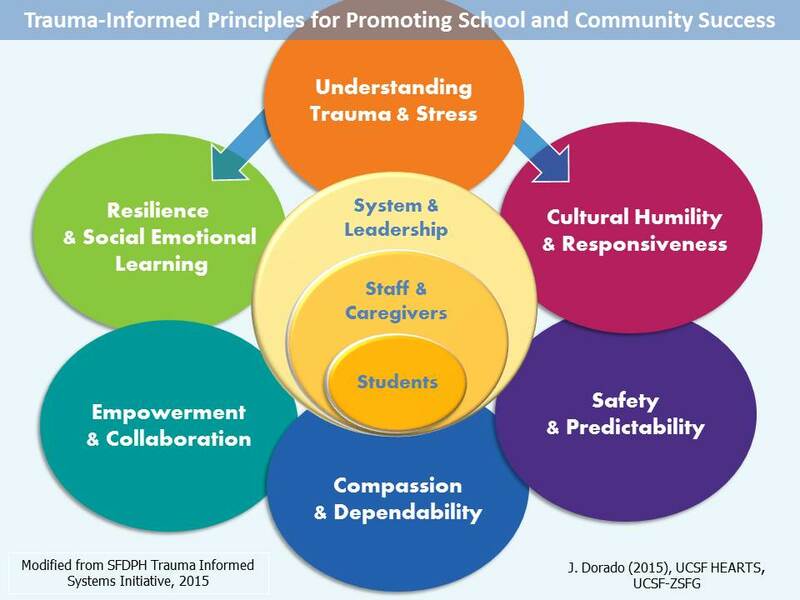 These principles are modified from those of the San Francisco Department of Public Health Trauma Informed Systems Initiative (SFDPH TIS), an initiative that the HEARTS director played a significant role in developing and implementing. The SFDPH TIS principles are based in research on trauma interventions and an extensive review of trauma-informed systems work across the country, including in the Substance Abuse and Mental Health Services Administration (SAMHSA). These six principles are applied to students and adult members of the school community (staff, caregivers, leadership) alike, as well as to the school system as a whole. They are aimed at promoting wellness and school success for all, and are particularly important for those impacted by trauma. While many of these principles are part of standard educational practices, the negative effects of chronic stress and trauma can make it difficult to consistently abide by them. We believe that educational strategies, procedures, and policies ultimately need to forward each of these six principles in order to be completely trauma-informed, and that practices can potentially be trauma-inducing if they go against any one of these principles. We have found it helpful to organize our trainings, consultations, and supports by these principles, and to use them to guide problem-solving discussions.